There is a strong connection between acid reflux and anxiety. Acid reflux and anxiety can play off of each other creating a problematic cycle of mental and physical discomfort. 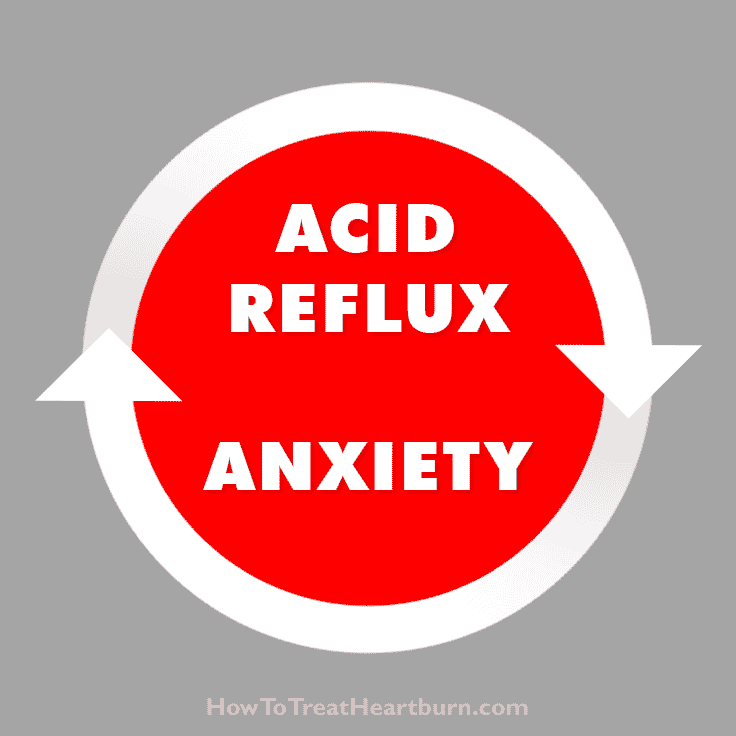 It’s important to understand how the two are connected in order to stop heartburn generated by acid reflux and anxiety. Anxiety is a normal phycological reaction to stress with feelings of worry, nervousness, or unease. Events of everyday life such as a test, important decision, presentation, or job interview can cause anxiousness. Chronic anxiety is more pronounced interfering with one’s ability to live a normal life. Chronic anxiety includes nervous disorders such as generalized anxiety disorder, specific phobias, panic disorder, and social anxiety. Physical symptoms are more likely to be seen in those that have chronic anxiety. Most of us experience acid reflux on occasion. When we swallow food, it travels down the esophagus into the stomach where stomach acid helps break down food. There is a ring of muscle at the base of the esophagus known as the lower esophageal sphincter (LES). The LES relaxes when we swallow food letting it pass into the stomach. It closes after the food passes to keep stomach acid out of the esophagus. Unfortunately, the LES doesn’t always close tightly enough allowing acid to leak up into the esophagus. This backing up of stomach acid into the esophagus is acid reflux, and the pain from acid irritating the esophagus is known as heartburn. The connection between acid reflux and anxiety is obscured by its various causes and psychosomatic connection. The two can play off each other. Stress and other psychological traits of anxiety can increase acid reflux symptoms and acid reflux symptoms can cause anxiety to increase. Hyperventilation is a common symptom of anxiety that can cause chest pain similar to heartburn. Anxiety sufferers may experience chest pain caused by muscle tension. A bitter or sour taste is sometimes present during acid reflux. This could help differentiate between acid reflux and anxiety symptoms. Muscle tension in the chest brought on by anxiety may increase abdominal pressure. Pressure on the abdomen can cause stomach contents to push up against the LES. This compromises the closure of the LES allowing acid to reflux into the esophagus leading to heartburn. Stress causes the brain to turn up pain receptors. This greater sensitivity or awareness of the symptoms is known as hypervigilance. Hypervigilance causes heartburn pain to increase during times of anxiety, though actual acid exposure may not increase. Those with gastrointestinal issues like chronic acid reflux are more susceptible to acid reflux issues and are more likely to experience an increase in heartburn during times of anxiety. Stress may cause an increase in stomach acid. As long as the LES closure keeps acids in place this may not be an issue but could lead to heightened acid levels in the esophagus if refluxed. Stress can cause a slowdown in digestion which can lead to additional abdominal pressure and an increase in stomach acid. Many anxiety sufferers resort to poor diet and lifestyle choices for comfort. Many of these are heartburn triggers such as overeating, drinking alcohol, caffeine, and smoking more if they are smokers. Psychiatric medications can cause the LES to relax and allow acid reflux. Anxiety can cause a drop in prostaglandins. Drops in prostaglandins cause a drop in gastric mucus secretion which protects the digestive lining against acid. Drops in prostaglandins also cause an increase in stomach acid production. Without proper prostaglandins levels, there may be an increase in acid reflux symptoms. Acid reflux symptoms can lead to further anxiety causing a cycle where acid reflux and anxiety feed off each other. Without remedying both acid reflux and anxiety, either can provoke the occurrence of each other through a cyclical effect. The many acid reflux symptoms can lead to anxiety which can in-turn fuel acid reflux symptoms. Or anxiety can raise the pain of heartburn leading to more anxiousness and so on. Acid Reflux Prevention: Lifestyle and dietary changes are the main ways to prevent acid reflux. Avoid heartburn triggers (i.e. tobacco, alcohol, and heartburn trigger foods), slow down while eating, do not over eat, avoid eating before bed, and sleep on an incline. If you suffer from chronic anxiety disorders such as generalized anxiety disorder, specific phobias, panic disorder, and social anxiety, help of a medical professional will be required to overcome these disorders. Stress related anxiety is common in our society and often unavoidable. Whether the stress comes from an external source or from internal pressures, anxiety can be managed through the coping mechanisms mentioned above. Occasional heartburn from acid reflux isn’t a serious health risk and can be managed by use of over-the-counter heartburn medication or natural heartburn remedies. If either anxiety or acid reflux are chronic, they should be treated by a health professional. Both acid reflux and anxiety can lead to other heath issues if left untreated. 1) Bradley LA, Richter JE, Pulliam TJ, Haile JM, Scarinci IC, Schan CA, Dalton CB, & Salley AN. “The relationship between stress and symptoms of gastroesophageal reflux: the influence of psychological factors.” National Center for Biotechnology Information, U.S. National Library of Medicine, The American Journal of Gastroenterology, January 1993. 2) C. Jansson; H. Nordenstedt; M.-A. Wallander; S. Johansson; R. Johnsen; K. Hveem; & J. Lagergren. “Severe Gastro-oesophageal Reflux Symptoms in Relation to Anxiety, Depression and Coping in a Population-Based Study.” Medscape, Alimentary Pharmacology & Therapeutics, 2007. I’m having a burning feeling in my throat and shortness of breath. When I try to burp my food comes up. Feels like it’s resting in my throat and chest. My eyes are bothering me and I feel like I’m losing my mind. What should I do? Juanita, I hope you’re feeling better by the time you read this. I can relate to your symptoms. They’re terrible! A good starting point is to check out the articles on heartburn medications and natural remedies. If you have chronic acid reflux, you should see a doctor who will help you with a treatment plan. Best! I have read all the suggestions about drinking vinegar (Braggs), but even salad dressings with vinegar cause me to cough and choke up, I am reluctant to try that since I have a burning throat most of the time. I was prescribed the ppis but they caused me to have worse panic attacks. Not sure what to do at this point but I will be seeing the dr soon. Hello Linda, it’s good that you are going to see your doctor. In most cases, diet and lifestyle changes can help people find relief from chronic acid reflux without having to resort to use of PPIs. I hope you find this to be true for you. There is a list of heartburn trigger foods and natural heartburn remedies on the site that you might find helpful. Praying for your peace and healing. My 22 year old son has Acid Reflux. He has taken every over the counter med for it-nothing helped. His Dr. prescribed an antibiotic which damaged the nerves in his throat(allergic reaction). What can he take for the severe, burning throat pain he is experiencing? Hello Margaret, a doctor will have to advise your son. The extent of the nerve damage may require stronger heartburn medications or your son might be able to improve his situation with lifestyle and diet changes. A good place to start would be natural heartburn remedies and learning what foods trigger heartburn. Very useful information and guideline to quit heartburn with anxiety and GERD. Thank you. Thank you, Riaz! I’m glad the anxiety and GERD information is of help. Best wishes and health! I always feel that I cant sleep. My doc recommended amide h. It gave the best result. I want to completely stop popping pills. Plz suggest to me a cure for my anxiety because of GERD. I have had a lot of issues with acid reflux and am always looking for remedies. Thank you for your tip about reducing stress to help with this. I have never heard of stress causing issues with this before. In addition to medicine, I will try to lower my stress as well as I try to find remedies to help prevent this. Hello, how are you going with the advance of controlling stress and thus the reflux, did you find an effective method? Not sure if anyone will see this. I do have issues with major anxiety. And I have noticed one of the outcomes of it is acid reflux. I get a burn sensation in my stomach and burning and tickling in my chest. My throat also gets sore. Went to the doctor to medicine for it and it helped the first time but then after that it stopped helping. Now I take it and it doesn’t help at all. The only time I feel no pain is when I sleep and right when I get up in the morning. After I eat my first meal it kicks in and I have pain for the rest of the day. I’m also always tired and exhausted even if i stay home all day. Not sure what to do here. Never had this problem until two months ago. Also I don’t know why the meds are not helping. Hi, I just read your post and your condition sounds similar to mine. I had Lyme disease twice so I was on harsh antibiotics that I believe hurt my stomach. I have always had a sensitive stomach, so I couldn’t handle caffeine or alcohol very well. But for the most part, until I took the Lyme meds, I was fine. The meds triggered the burning sensation you describe and nausea as well. I also had this tickle you mention which I believe is a stomach palpitation. I had an endoscopy that revealed a very red and irrtitated stomach. I also believe that I was having trouble digesting gluten so I removed that from my diet as well. With that said, I was put on Nexium, a PPI, which seemed to help at first but then it seemed the symptoms came back worse. Out of desperation, I stopped the Nexium and began drinking Braggs Organic Apple Cider vinegar (with the mother) and my symptoms have improved dramatically! After 3 weeks, the palpitations have pretty much stopped. I do feel occasional heartburn, but as I drink the vinegar, the pain goes away. I still don’t know the exact cause of the issue, but I do think the ACV is healing it. I drink about a cup of water mixed with a teaspoon of ACV and a teaspoon of honey 3 to 4 times a day. You may want to try this, as I don’t believe it will hurt you. Good Luck! You can also try with plantago leaves, just put them in a blender, strain and drink the juice. That worked for my husband. I read that potato juice is good too, but never tried it. And also teas, for long-term solution. But you have to find all the plants. I can send you the link with all teas. I haven’t tried to make them, i just believe in natural cures like the one with plantago leaves. Oh, and for instant relief I use a pinch of baking soda, that helps me every time, especially when I was pregnant. I haven’t try Apple cider vinegar, but I’ll try next time. Thank you, Natalie. You might like to check out our article on teas for naturally treating heartburn (https://howtotreatheartburn.com/teas-for-naturally-treating-heartburn/). Potato juice, baking soda, and apple cider vinegar are all great natural heartburn remedies. The baking soda heartburn remedy should be avoided if someone is watching salt levels. Baking soda (sodium bicarbonate) is high in sodium. It’s not often advised for use during pregnancy for this reason. I’ve not tried plantago leaves. I’ll look into that treatment. So great of you to mention another remedy! Have a wonderful day! Heartburn and GERD are caused by to weak stomach acid, It causes poor digestion of food allowing “rotten food” to produce gas which in turn builds up stomach pressure forcing the acid up the esophagus. In short to relieve this problem take 2 teaspoons of vinegar in a glass of Luke warm water before you eat or during the heartburn or GERD episode, relief in many cases experienced almost immediately. Some people use Apple cider vinegar. We all know this information cannot be made public in order to protect certain products from financial loss. Apple cider vinegar is a great choice. I use it to help with heartburn and balance pH levels… Thank you for your helpful comment, Pieter. Have a great weekend!